Envision the harsh but beautiful landscape of northern Sweden above the Arctic Circle, sometimes referred to as the land of the midnight sun and the northern lights. This country is the home for the Saami people, a semi nomadic tribal group also known as Lapplanders. 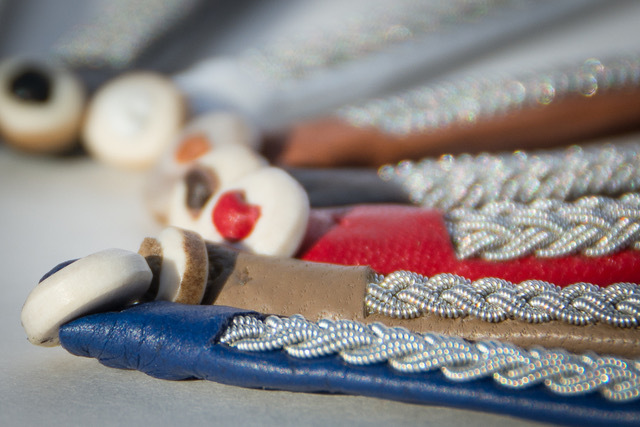 Pewter thread embroidery is an old handcraft that has been used by the Saami’s since the 1600 century for decorating their costumes and tools. The traditional handcraft of pewter thread embroidery and it's history was something I learned about while growing up in northern Sweden. When I moved to California in 1995 I brought materials with me to continue with my hobby and passion for this art, quickly I noticed a big interest and curiosity for the handcraft and its history. I craft my jewelry out of pewter coil which has a 4% silver alloy and is nickel free, vegetable tanned reindeer hide and antler buttons. I braid the coil into braids and intricate patterns and sew them by hand onto the leather. All my jewelry is made and designed by me in my Mill Valley studio.